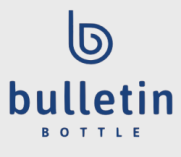 Custom aluminum water bottles are popular options for metal water bottles, and Bulletin Bottle [.com] is proud to feature a hand-picked selection in popular designs. Our aluminum water bottles feature quality construction and a wide variety of colors. Because aluminum reacts with certain liquids, aluminum water bottles must be lined–typically with an enamel, resin, polymer, or epoxy. All of our aluminum water bottles have BPA-free, food-grade liners. BPA-free aluminum bottles are lower-cost alternatives to trendy stainless steel. They are lighter than stainless bottles, and have a higher perceived value than plastic water bottles. We recommend hand-washing aluminum water bottles with warm water and dish soap. A bottle brush can be used to ensure the inside of the water bottle is cleaned. BPA free aluminum bottles are popular and here to stay! Stainless steel vs aluminum water bottles: which is best for me? How do I wash aluminum water bottles?